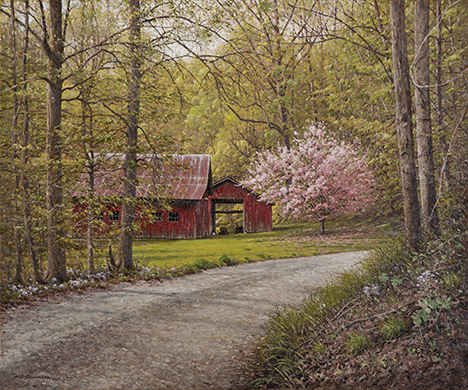 In mid-April this shed and the beautiful flowering crab apple tree were a nice contrast to the soft greens of the surrounding woods along Bucklew Road west of Spencer. No, the road is not named after me, but my brother, who owns the adjoining property. As hard as I worked on this painting, it should be named after me–after all, he lives in Virginia. It was voted the People’s Choice Award at the Indiana Heritage Arts Exhibit in 2011. Published December 9, 2013 at 468 × 390 in Artist’s Favorites Gallery.